We’re excited to announce that our new and refreshed website has been launched and is already on orbit. The renewed site includes easy navigation and responsive content for both mobile and desktop devices. We’ve also improved and simplified the structure of our content. 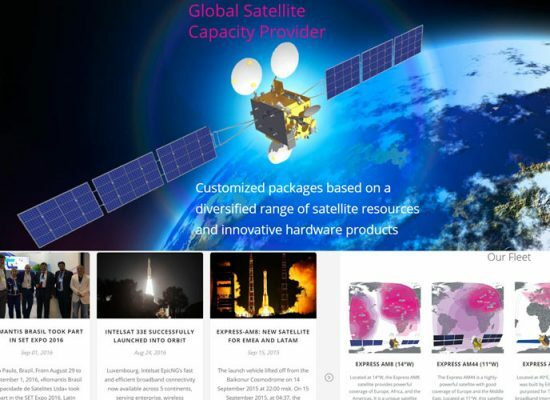 The new website contains a lot of extended information about Romantis satellite capacity, footprint, satellite technical data etc. Before we started the project we had studied experience of our visitors to help users get from one place to the next without skipping our most important content. Our solution was to split our site content into two major places. We now have ‘Home page’ with all the most important information about our company and services and ‘Satellites’ with the information about our satellite capacities. If you’d like to know more about what we do, then our home page can help. In the ‘Satellites’ page, we’ve collected a list of the satellites with the capacity offered by Romantis. The support and other resources are still available, and only a single click away. We have also created a host of new footprints, published a gallery’s worth of images, and included a few updates that have made the site easier to use. Our new contact forms allow our customers approaching different departments of Romantis directly streamlining our cooperation. We have also integrated a form for Occasional Use capacity booking. You can find the most suitable satellite capacity even faster than before or can give us an order to find it for you.